On top of the daily traffic congestion and crashes, there are a dizzying array of reversible, restricted and controlled-access highways across the D.C. area. Here are the rules of the road and reversal times for the high-occupancy highways and reversible parkways across the region. WASHINGTON — On top of the daily traffic congestion and crashes, there are a dizzying array of reversible, restricted and controlled-access highways across the D.C. area. Below you’ll find the rules of the road and turn-around times for the high-occupancy highways and reversible parkways across the region. The lanes are closed for about two hours during reversals. The reversal times during summer months and getaway weekends varies. In the Washington area, not all express lanes are created equal. The term “express lanes” is a catchall for a set of limited-access lanes on a highway. In Maryland on I-270, the main lanes are labeled as “express lanes” on the overhead signs. The WTOP Traffic Center refers to these lanes as the main lanes to avoid confusion, since the term “express lanes” has a different meaning in Virginia. In Virginia, the term “express lanes” can refer to High Occupancy Vehicle (HOV) lanes and High Occupancy Toll (HOT) lanes. In both cases, these lanes are geared toward carpools, van pools, buses and motorcycles — modes capable of moving more people in less time. HOV lanes are roadways that are restricted to carpools with two or more people. Solo drivers are not allowed in the lanes during rush hours. HOT facilities are a form of toll road, for which the cost to use the lanes changes based on demand and the distance traveled. The price increases during busier times of the day to manage the amount of traffic in the lanes, a measure designed to keep traffic moving without delay. In a region inhabited by more than 6 million people, not to mention countless daily visitors passing through, every modicum of throughput helps. The express lanes on Interstate 95 in Virginia extend from northern Stafford County to just north of the Capital Beltway in Springfield. The express lanes on the Beltway extend from the Springfield Interchange to just north of the Dulles Toll Road in McLean. On I-95 and the Beltway, the express lanes are sandwiched between the northbound and southbound mainline highways. Drivers who use these HOT lanes must have an E-ZPass or E-ZPass Flex properly mounted on their windshield. The lanes comprise an all-electronic toll road for solo drivers and carpools alike. With an E-ZPass Flex device, carpools with three or more people can use the lanes for free. Motorcycle drivers are also allowed to use the lanes for free. Otherwise, tolls are in effect 24/7. Vehicles with more than two axles are prohibited. WTOP Traffic sometimes refers to these lanes are “E-ZPass Lanes” to better convey the requirement for drivers to have an E-ZPass transponder to use the lanes. The cost to drive in the lanes is based on the amount of traffic in the lanes at that moment in time. This is known as “congestion pricing” and is a tactic operators of the lanes use to moderate the amount of traffic to provide a reliable trip. The prices are displayed on electronic signs near the entrance and exit ramps. Similar toll roads exist in Atlanta, Minneapolis, Seattle, Houston and Denver. The HOV lanes on I-95 in Virginia were converted to HOT lanes and opened to traffic under a new set of rules in late 2014. The lanes are reversible, open to northbound traffic during the morning rush hour and open to southbound traffic for the afternoon rush hour. On Saturdays, the lanes are open to southbound traffic through early afternoon and to northbound traffic from Saturday afternoon through the rest of the weekend. The lanes are closed for about one to two hours during each reversal so that traffic can safely exit and so crews can clear hazards such as broken-down vehicles. At the time of this writing, the I-395 HOV lanes are being converted into HOT express lanes. Currently, the express lanes from north of Edsall Road to south of the Pentagon remains an HOV highway during weekday rush hours. HOV-3 rules are in effect from 6 a.m. and 9 a.m. and from 3:30 p.m. to 6 p.m. Monday through Friday. All vehicles must have three or more occupants in order to use the lanes during HOV hours. The lanes are unrestricted during off-peak hours and on weekends but the ramp to and from Seminary Road is HOV-3 at all times. 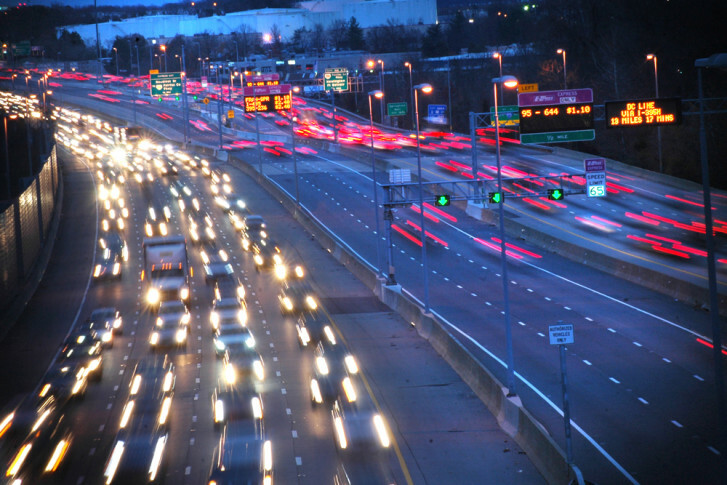 The HOV rules on I-395 will be enforced for several more months, but changes are coming. Just like on I-95, HOT rules and tolls are scheduled to take effect by fall 2019. Once the conversion takes place, the rules will be consistent along the entire length of the facility from Stafford County to Washington. The HOV highway on I-395 was the first HOV freeway in the United States and one of the first the world. The current carpool rules on Interstate 66 are much different than any other highway in the region, and rush hour commuters must follow two sets of rules when traveling inside and outside the Beltway. There are no restrictions for drivers traveling during off-peak hours or on weekends. On I-66 inside the Beltway, tolls are in effect for eastbound drivers for four hours in the morning and for westbound drivers for four hours in the afternoon. Tolls are in effect for eastbound drivers from 5:30 a.m. to 9:30 a.m. and for westbound drivers from 3 p.m. to 7 p.m. All traffic traveling on I-66 inside the Beltway during those times must have an E-ZPass. Drivers with one or more passengers (HOV-2 vehicles) can travel for free if their vehicles are equipped with an E-ZPass Flex switched to HOV mode. Outside the Beltway, the interstate’s left lane between Vienna and Manassas is an HOV-2 only lane. HOV-2 rules are in effect during the same times; eastbound from 5:30 a.m. to 9:30 a.m. and westbound from 3 p.m. to 7 p.m. The on- and offramps at Monument Drive and Stringfellow Road in Fairfax County are only open to HOV-2 traffic during these times. The left lane of the Dulles Toll Road is also an HOV-2 lane during rush hours — eastbound from 6:30 a.m. to 9 a.m. and westbound from 4 p.m. to 6:30 p.m.
Two highways in Maryland offer HOV-2 lanes. On Interstate 270 in Montgomery County, the left lanes are HOV during rush hours. Southbound vehicles with two or more occupants may use the HOV lane from 6 a.m. to 9 a.m. Northbound carpools can use the left HOV lane from 3:30 p.m. to 6:30 p.m.
On U.S. Route 50 between Bowie and the Beltway, the left lanes are full-time HOV-2 lanes. The Maryland State Highway Administration says the decision to enforce the restrictions 24/7 was based on safety concerns and engineering judgment and was made to prevent driver confusion. HOV and HOT express lanes are capable of moving more people with fewer vehicles, something transportation planners rely on to manage traffic congestion. The incentive for commuters who plan ahead is a speedy, reliable trip. There are toll facilities on eight roads within the Washington metropolitan area and the rules on each route vary. Some tolls can still be paid with cash, while many others are collected electronically. All tolls in the D.C. area can be paid with a funded, properly mounted E-ZPass. E-ZPasses can be purchased online, at AAA Mid-Atlantic locations, select grocery stores, Virginia DMV locations and Maryland Stop-In Centers. The following rates are for two-axle vehicles. The price for trucks with three or more axles is significantly higher at all tolling locations. Tolls on the Dulles Toll Road are collected at the main toll plaza just west of the Beltway and on most of the westbound off-ramps and eastbound on-ramps. It costs $2.50 to pass through the main toll plaza and $1 at the ramp toll booths. Tolls will be increased in January 2019. There is no toll to exit or enter the toll road from Wolf Trap National Park, and traffic headed toward or away from Dulles International Airport is not tolled. Drivers en route to the airport should enter the Dulles Airport Access Highway, which runs between the eastbound and westbound lanes of the Dulles Toll Road, as soon as possible to avoid all tolls. The best way to pay is with an E-ZPass, since it is accepted at all toll booths. Credit or debit cards are not accepted anywhere on the Dulles Toll Road. Drivers paying with cash should look for toll booths labeled “full service.” At certain times of the day, long lines can form at these toll booths. Additionally, toll booths on the ramps are unmanned from 9:30 p.m. to 5:30 a.m., so during these times an E-ZPass or exact change is required. Coins are accepted on the DTR, but in recent years the Metropolitan Washington Airports Authority has reduced the number of “exact change” toll lanes available at the main toll plaza and some exit ramps. A trip on the Dulles Toll Road requires many more quarters today than it did 20 years ago! The tolling is operated by the Metropolitan Airports Authority. The Dulles Greenway is a privately-owned toll facility separate from, but connected to, the Dulles Toll Road. The off-peak cost to drive the entire length of the westbound lanes Dulles Greenway between the Dulles Toll Road and the Leesburg Bypass is $5.40. A partial westbound trip between exits is $4.40 during off-peak hours. The eastbound cost ranges from $2.80 to $5.40 and is dependent on both the destination and method of payment; E-ZPass users pay about 50 cents less than those paying with cash or credit. Drivers pay an extra 95 cents during rush hours — that’s between 6:30 a.m. and 9 a.m. and between 4 p.m. and 6:30 p.m. Monday through Friday. The short segment from Route 15 to Battlefield Parkway is free at all hours of the day. Tolls for trucks are significantly higher than those for smaller passenger vehicles. The price increases for each additional axle. The maximum toll for the largest trucks traveling during rush hour is $22.25. Tolls for the express lanes on I-95 and I-495 are collected electronically. Drivers who opt for these lanes are required to have a properly mounted E-ZPass in the vehicle, since there are no toll booths. The tolls are variable and fluctuate as traffic volume in the express lanes rises and falls. When traffic is light, the cost to drive in the express lanes can get down to 20 cents per mile. During rush hours or when traffic is otherwise heavy, it can exceed 80 cents per mile. The prices to travel specific segments of the express lanes are displayed on signs above the lanes and near the entry points. The facilities are operated by Transurban through a public-private partnership with the Virginia Department of Transportation. Click here for and trip planner and real time toll rates. Drivers with one or more passengers (HOV-2 vehicles) can travel for free provided their vehicles are equipped with an E-ZPass Flex switched to HOV mode. Tolls are variable, rising and falling based on demand, and collected electronically. The cost to drive during rush hour varies depending on distance traveled and the time of day. Peak tolls as of early 2018 were around $46. The tolling is operated by VDOT. Click here for real time toll rates. Maryland Route 200, the Intercounty Connector, is an all-electronic toll road that courses through upper Montgomery County between I-95 in Laurel and I-270 in Gaithersburg. The Maryland Transportation Authority, operator of the highway, urges drivers to have an E-ZPass before committing to the road. Drivers without E-ZPasses are legally allowed to travel the road but should expect to receive a bill in the mail for 150 percent of the base toll. Unlike the Virginia Express Lanes, tolls on the ICC are not based on real-time traffic flow but are based on average demand and distance traveled. Tolls are highest during rush hours and lowest during the overnight hours. Drivers of two-axle vehicles and motorcycles can expect to pay up to $3.86 during rush hours from 6 a.m. to 9 a.m. and 4 p.m. to 7 p.m. During off-peak daytime hours, the cost to drive the entire stretch drops to $2.98. It costs nighttime drivers up to $1.23 to travel the length of the highway between 11 p.m. to 5 a.m. Traveling between exits is cheaper. Click here for more information on ICC tolls. Eastbound drivers on Route 50 in Anne Arundel County are expected to pay tolls before crossing the Bay Bridge. The base toll is $4 but as of July 2015 Maryland E-ZPass users are charged $2.50. Maryland also offers daily commuters a discount plan, good for 25 trips within 45 days for a cost of $35. At the Route 301 Governor Nice Bridge, tolls are only collected for traffic leaving Maryland in the southbound direction. A $6 toll is collected for two axle vehicles but Maryland E-ZPass users are only charged $4.50. Daily Maryland commuters can pay $52.50 for 25 trips within 45 days. Both facilities, along with the ICC, are operated by the Maryland Transportation Authority. Click here for more information on specific toll rates at the Bay Bridge.